An ERC CoG has been awarded to Michael Hothorn for his research project entitled « System-wide discovery and analysis of inositol pyrophosphate signaling networks in plants (InsPire) ». The aim is to uncover nutrient signaling networks in plants. The grant is endowed with 2 million Euros over 5 years. HHMI, the Bill & Melinda Gates Foundation, the Wellcome Trust, and the Calouste Gulbenkian Foundation announce the selection of 41 International Research Scholars, early-career scientists poised to advance biomedical research across the globe. Forty-one scientists from 16 countries have been chosen as International Research Scholars, exceptional early-career scientists poised to advance biomedical research across the globe. The Howard Hughes Medical Institute (HHMI) has teamed up with the Bill & Melinda Gates Foundation, the Wellcome Trust, and the Calouste Gulbenkian Foundation to develop scientific talent around the world, and will award a total of nearly $26.7 million to this group of scholars. Each researcher will receive a total of $650,000 over five years. The award is a big boon for scientists early in their careers, and offers the freedom to pursue new research directions and creative projects that could develop into top-notch scientific programs. A panel of distinguished scientists reviewed more than 1,400 applications, and evaluated both the impact of past work, including doctoral and postdoctoral achievements, and the promise of work to come. It’s a researcher-focused approach that emphasizes the skills and talents of the individual, rather than solely the projects proposed. “We are proud to partner with HHMI, the Bill & Melinda Gates Foundation, and the Wellcome Trust to support this truly exceptional group of young biomedical scientists. Biomedical research is increasingly at the core of the work of our research institute, the Instituto Gulbenkian de Ciência,” said Gulbenkian Institute Director Jonathan Howard. HHMI, the Bill & Melinda Gates Foundation, the Wellcome Trust, and the Calouste Gulbenkian Foundation announced the 2017 International Research Scholars competition in March 2016. The competition was open to early-career scientists who held a full-time position at a research-oriented university, medical school, or nonprofit institution, and had been running their own labs for less than seven years. Candidates also had to work in an eligible country, and have received training in the United States or the United Kingdom for at least one year. Michael Hothorn is piecing together how plants sense essential nutrients in the soil and send signals from cell to cell. A molecular understanding of how plants detect and respond to changes in phosphorus levels, for example, could help researchers engineer crops that can survive when nutrients are scarce. SPX domains of previously unknown function are present in fungi, plants and animals. Several SPX domain crystal structures reveal a novel fold and a binding site for inositol pyrophosphates, enigmatic signalling molecules whose levels change in response to nutrient starvation. SPX domains are small, soluble domains found in fungi, plants and animals. They can exist as stand-alone modules but are often located at the N-termini of proteins involved in phosphate uptake, transport, storage, metabolism or signalling. We determined 3.3 – 1.9 Å structures of fungal and human SPX domains from crystals obtained by carrier driven crystallisation and including data collected at beamline ID29 . The different structures revealed a new fold with two long a-helices, connected by linkers of variable size. These core helices and two smaller C-terminal helices together form a 3-helix bundle, which is preceded by a flexible N-terminal helical hairpin (Figure 91). Many invariant lysine residues, which represent sequence fingerprints for SPX domains, are clustered in proximity to the N-terminal hairpin structure. A combination of genetic and biochemical experiments in yeast and Arabidopsis revealed that this basic surface represents a docking platform for inositol pyrohosphosphates (PP-InsPs), signalling molecules with poorly characterised cellular functions (Figure 91). Fig. 91: Ribbon representation of the crystal structure of the SPX domain of C. thermophilum glycerophosphodiesterase SPX domain in complex with inositol hexakisphosphate (stick representation). Inset: close-up view of the PP-InsP binding site, with many conserved lysine residues coordinating the phosphate groups of the ligand (dotted lines). The concentrations of PP-InsP are known to change in cells, depending on whether they are supplied with sufficient amounts of inorganic phosphate or whether they experience phosphate starvation. 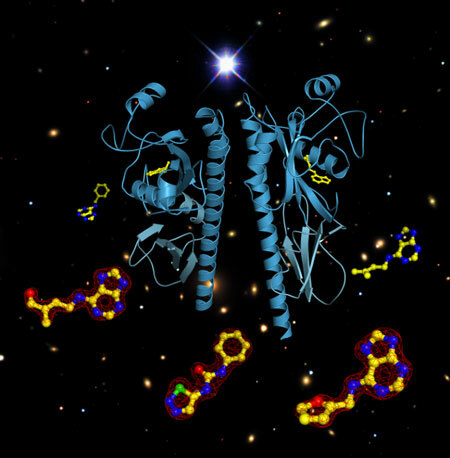 We could demonstrate that SPX domains, when bound to PP-InsPs can interact with other proteins. In plants, one such interaction partner is a transcription factor, which is switched on under phosphate starvation to induce expression of genes that allow the plant to respond to the lack of this important nutrient. Under normal growth conditions, when PP-InsP levels are high, the transcription factor is kept inactive by forming a PP-InsP-dependent complex with a plant SPX domain. Under phosphate starvation, the lack of PP-InsP leads to dissociation of the transcription factor – SPX domain complex, thereby enabling the transcription factor to transcribe its target genes. Taken together, our work defines SPX domains as cellular receptor for PP-InsPs, which control phosphate uptake, transport, storage, metabolism and signalling in fungi, plants and animals. UniGe press release April 14, 2016. Inorganic phosphate is an essential building block of cell membranes, DNA and proteins. It is also a main component of ATP, the “cell currency” of energy transfer. All cells therefore need to maintain a sufficient concentration of phosphate in their cytoplasm and have developed systems to transport and store this nutrient. But how does a cell know how much phosphate it actually needs? Researchers from the University of Geneva (UNIGE) and the University of Lausanne (UNIL), Switzerland, report that a region of specific proteins, the so-called SPX domain, signals the phosphate status to fungal, plant and human cells. This domain provides a binding surface for small molecules that regulates the uptake of the nutrient into the cell. Their findings, which now appear in Science, could contribute to the development of crops that use phosphate more efficiently. In order to function properly, eukaryotic cells, i.e. cells from higher living organisms, need to maintain sufficient phosphate levels. To absorb this macronutrient, fungal, plant and human cells have developed transport and storage systems. How cells know how much phosphate they contain at any given time remained however unclear. 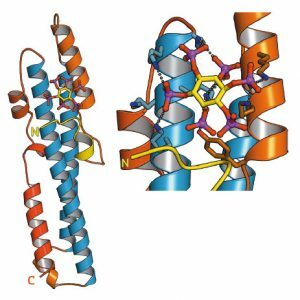 Michael Hothorn, Professor at the Department of Botany and Plant Biology of the faculty of Science of UNIGE, and his research group revealed the crystal structure of a novel protein domain called SPX, which is involved in many phosphate signaling pathways. They discovered that SPX provides a binding surface for small compounds called inositol pyrophosphate signaling molecules (InsP), which can interact with other proteins only when they are bound to the SPX domain. As SPX domains can be attached to different proteins, such as enzymes, transporters or signaling proteins, the biologists hypothesized that InsP regulate various cell processes involved in phosphate homeostasis, from yeast to human cells. Wild from UNIGE, another of the first co-authors. 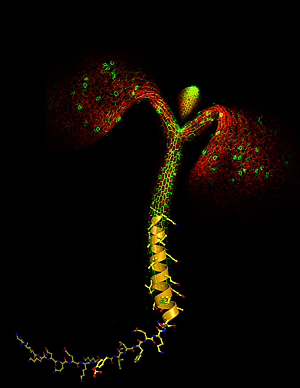 Yves Poirier, Professor at the Department of Plant Molecular Biology of UNIL, and his colleague Ji-Yul Jung further demonstrated this with the model plant Arabidopsis thaliana: when SPX domains present in phosphate transporters are mutated in the spot that normally binds InsP, phosphate transport is impaired. The role of InsP was initially elucidated in yeast cells: «We came across InsP while studying the mechanism of phosphate polymerization – its assembly into long chains – for the storage of this compound, and our data show that the SPX domain is a receptor for InsP», states Andreas Mayer, Professor at the Department of Biochemistry of UNIL. Once the SPX domain is filled, it activates the enzyme involved in phosphate storage. This research now opens up new pathways to study and better understand phosphate homeostasis in organisms and may even lead to a more efficient phosphate use in crops. «Crops on the fields are usually lacking phosphate and therefore need to be fertilized. However, the resources of phosphate fertilizer are declining worldwide. Our discovery could open the door to the development of crops that could grow efficiently on less phosphate», says Michael Hothorn. During their life, plants constantly renew themselves. They sprout new leaves in the spring and shed them in the fall. No longer needed, damaged or dead organs such as blossoms and leaves are also cast off by a process known as abscission. By doing so, plants conserve energy and prepare for the next step in their life cycle. But how does plant know when it is the right time to get rid of unnecessary organs? Researchers from the University of Geneva (UNIGE) and the University of Oslo (UiO) now shed light on this process. It is regulated by receptor proteinslocated at the surface of specific cells that form a layer around the future break point. When it is time to shed an organ, a small hormone binds to this membrane receptor and, together with a helper protein, the abscission process is initiated. Their findings are now published in the journal eLife. “It was already known that the membrane receptor protein HAESA and a small peptide –a short chain of amino acids – hormone called IDA are involved in the same signaling pathway and, together, control the shedding of floral organs. So far, however, the mechanism underlying their interaction was poorly understood”, explaind Michael Hothorn, professor at the Department of Botany and Plant Biology of the Faculty of Science of UNIGE. By solving the crystal structure of HAESA (from the Greek ‘to shed’) in complex with IDA, Hothorn and his team found out that the receptor directly senses the peptide hormone. They observed that HAESA contains a small cleft into which IDA fits perfectly. However, it only binds halfway to the receptor. To fully initiate the abscission process, another player is needed: the helper protein SERK1. IDA then works like a double-sided Scotch tape that tethers the entire complex together. The binding of SERK1 to HAESA and IDA triggers the molecular switch that instructs the cell to shed the organ. “The fascinating thing about SERK1 is that it not only plays a role in the shedding mechanism of plant organs, but also acts together with other membrane receptors that regulate totally different aspects of plant development”, says Julia Santiago, first author of the study. Indeed, SERK1 is a versatile helper protein shared between different signaling pathways. When bound to another protein receptor, it can also for example signal the plantto grow. To verify their findings, the biologists from UNIGE collaborated with Melinka Butenko’s group from UiO. By studying genetically modified Arabidopsis thaliana plants, the Norwegian researchers confirmed the role of SERK1 in plant organ shedding. Their data were then statistically analyzed by professor Ludwig Hothorn from the Leibniz University Hannover. Now that they found out what is going on at the surface of plant cells before organ shedding, Michael Hothorn and his team want to discover what happens inside the cell. “ How exactly the molecular switch for abscission works is still largely unknown”, explains Michael Hothorn. EMBO press release November 12, 2014. EMBO announced today the selection of 27 young researchers as EMBO Young Investigators. The scientists join a network of 342 current and past Young Investigators who represent some of the best young group leaders contributing to research in Europe and beyond. This year the programme received 202 applications. Thirteen per cent of the candidates who applied were selected and the new investigators originate from 11 countries. The Young Investigator Programme provides support for researchers who have established their first laboratories in the past four years. The researchers receive a range of benefits, including an award of 15,000 Euros and the opportunity to apply for additional funds to help start their first independent research laboratories. Laboratory management and non-scientific skills training as well as PhD courses offer the young group leaders and their students the chance to develop professional skills. The scientists also receive access to core facilities at EMBL and funding for themselves and their group members to attend conferences. 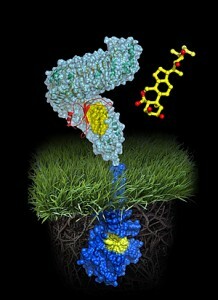 If one wants to better understand how plants grow, one must analyze the chemistry of life in its molecular detail. Michael Hothorn from the Friedrich-Miescher-Laboratory of the Max Planck Society in Tübingen and his team are doing just that. Their latest work, published this week in Science, now reveals that a plant membrane receptor requires a helper protein to sense a growth-promoting steroid hormone and to transduce this signal across the cell membrane. Brassinosteroid receptor activation. (left panel) The steroid hormone brassinolide binds to a surface pocket of the BRI1 receptor (in blue). This creates a docking platform for the smaller and shape-complementary LRR-domain of SERK1 (in orange), which binds on top, with the steroid acting as a molecular glue (right panel). Image by Julia Santiago. Every cell is surrounded by a greasy cell membrane. 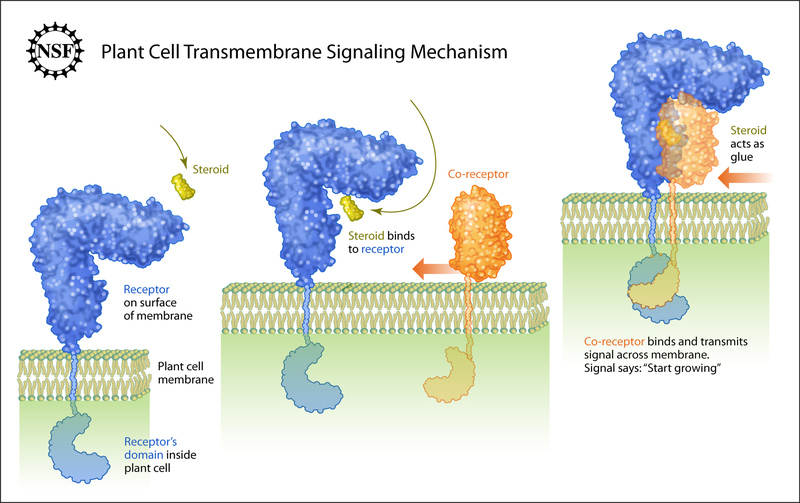 Signals from other cells and from the environment must be sensed at the cell surface, transduced across this membrane and translated into a specific response inside the cell. All organisms have evolved membrane receptor proteins to get these complex tasks done, but plant membrane receptors look drastically different from the well studied players in animals and bacteria. The plant steroid receptor BRI1, which can sense a small steroid hormone promoting plant growth, belongs to the family of leucine-rich repeat (LRR) receptor kinases, which are responsible for most membrane signaling events in plants. It was previously shown that BRI1 directly binds the small steroid hormone with its LRR-domain at the cell surface. Julia Santiago, a postdoctoral fellow in the Hothorn lab, could now demonstrate that BRI1 requires a helper protein to correctly sense the hormone and transduce the signal across the membrane. The helper SERK1 is a known player in the brassinosteroid signaling pathway, but it came as a surprise to see how early on it is required. By hitting protein crystals containing the ternary BRI1 – steroid hormone – SERK1 complex with intense X-rays, Santiago could see that SERK1 contributes directly to the formation of the hormone binding pocket, with both proteins interacting with the hormone. The steroid thus acts as a molecular glue which promotes association of the BRI1 and SERK1 LRR domains at the cell surface. This then causes interaction of the cytoplasmic kinases domains in the cell interior, which in turn activates a well characterized signaling pathway triggering the growth response. The authors. From left to right. 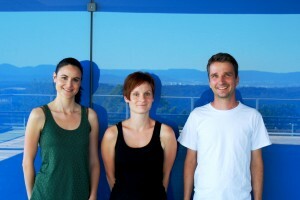 Julia Santiago (postdoctoral fellow, supported by a FEBS long-term fellowship), Christine Henzler (research assistent) und Michael Hothorn of the Friedrich-Miescher-Laboratory of the Max Planck Society. The interesting feature of SERK1 is that it can help activate several seemingly unrelated plant receptor kinases, which bind vastly different ligands and trigger different responses. 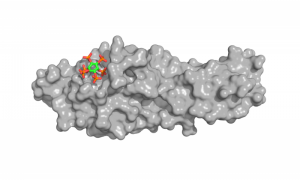 The new structures provide a first glimpse on how SERK1 might be able to do that. Instead of shaking hands with BRI1, it only uses a few ‘finger tips’ to contact the receptor. Other, strictly conserved surface patches remain available for the interaction with other plant receptor kinases and, potentially their ligands. “There must be some advantage to having all this different functions combined into a single helper protein”, Hothorn speculates. Notably, the use of a shared helper protein could allow different signaling pathway to communicate with each other. Max Planck Society press release September 18, 2012. Fulvia Bono, research group leader at the Max Planck Institute for Developmental Biology, as well as Wolfram Antonin and Michael Hothorn, both Max Planck research group leaders at the Friedrich Miescher Laboratory in Tübingen, will each be awarded a Starting Grant of the European Research Council (ERC). For the realization of their project ideas evaluated as scientifically excellent, the three scientists will each receive up to 1.5 million Euros over the next five years. ERC Starting Grants aim to support up-and-coming research leaders at an early stage of their career to conduct independent research in Europe. According to the ERC, 800 million Euros will be spend to award 536 researchers in Europe Starting Grants this year. 4,741 scientists Europe-wide had applied for the highly funded grants that are awarded for scientifically excellent research proposals. ERC Starting Grants represent a personal distinction for the individual scientist and provide funding for up to 5 years. This year’s awards highlight the scientific excellence of the entire Tübingen Max Planck Campus: Including 2010 ERC Starting Grant recipients Gáspár Jékely and Richard Neher from the Max Planck Institute for Developmental Biology, five of the 13 independent young research group leaders at the MPI for Developmental Biology and the Friedrich Miescher Laboratory are now funded by ERC Starting Grants. Since 2011, Fulvia Bono has been leading an independent research group at the Max Planck Institute for Developmental Biology. She investigates the role of the intracellular transport of macromolecules in the regulation of gene expression. With the funds from the ERC Starting Grant she will extend her research to include the study of the crucial role that the correct messenger RNA (mRNA) localization in the cell cytoplasm plays during animal development, in the maintenance of cell polarity and in nervous system function. Messenger RNA is combined with certain proteins to form particles, the so-called mRNP complexes. In the fruit fly Drosophila, the localization of these complexes determines the formation of the embryo’s body axis. Fulvia Bono wants to understand the function of the mRNP systems at a mechanistic level and gain deeper insight into the connection between genes and outer appearance of organisms. With the ERC Grant she will recruit several new members for her research group. “With the expanded resources of the ERC grant, I can accept some more scientific challenges I could not have thought of otherwise,” she says. Fulvia Bono received her PhD from the University of Pavia in 2000 and continued her research at the European Molecular Biology Laboratory (EMBL) in Heidelberg for five years. From 2008 to 2011, she was a project leader at the Max Planck Institute for Developmental Biology. Wolfram Antonin has been a Max Planck research group leader at the Friedrich Miescher Laboratory since 2006. His main research topic is the breakdown of the nuclear envelope, which separates the nucleus with the DNA from cell cytoplasm, in the process of cell division and its reassembly after formation of the daughter cells. With the ERC Starting Grant he will be able to start an additional project with several new team members and pursue his interest in DNA decondensation. During cell division, the DNA has to be contracted up to 50 times in the chromosomes to a transport form. After the formation of the new daughter cells, the DNA is unpacked again for transcription and replication. Wolfram Antonin had noticed that, while the packing of the DNA is a well-studied process, little is known of DNA decondensation. “It is possible,” the scientist says, “that DNA decondensation is a passive process, as if a clip around the DNA thread is released and the DNA just relaxes.” However, initial experiments hint at an active process. Wolfram Antonin wants to investigate this process and the proteins involved. “This is a high-risk research project, since we cannot say anything about the outcome. This is special about the ERC grants, that the sponsor trusts the skills of the scientists themselves and funds promising project ideas,” he says. Wolfram Antonin obtained his PhD at the Max Planck Institute for Biophysical Chemistry in Göttingen in 2001. After receiving post-doctoral training at the European Molecular Biology Laboratory (EMBL) in Heidelberg, he joined the Friedrich Miescher Laboratory in 2006. Since the beginning of 2012, Michael Hothorn has been building up his Max Planck research group at the Friedrich Miescher Laboratory. His research field is structural plant biology; he investigates signaling pathways in plant cells. With the funding from the ERC Starting Grant he will be able to start an additional project on the search for the enzyme responsible for the assembly of phosphate polymers in plant cells. The corresponding enzyme in bacteria has been known for a long time, yet it does not exist in the cells of higher organized organisms, like plants or mammals. “The function of the phosphate polymers is enigmatic,” the scientist says. “It has been suggested that they are used to store phosphate in plant cells and tissues.” The project may, in the future, have applications in crop science, as, at present, many crop species require the application of phosphate fertilizers. “Without the ERC Grant, I could not afford a project of this size and kind. The sparse results from our first experiments would not have been sufficient for the usual ways of obtaining research funding. The prospect of our high-risk project is to find out something fundamentally new, yet the risk is to receive detached data we are not able to connect,” the scientist says. After obtaining his PhD at the European Molecular Biology Laboratory (EMBL) in Heidelberg in 2006, Michael Hothorn carried out research at the Salk Institute for Biological Studies in La Jolla before joining the Friedrich Miescher Laboratory in 2011. 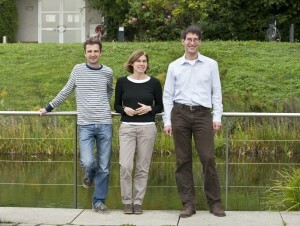 Max Planck Society press release March 29, 2012. Michael Hothorn, biologist and Max Planck research group leader at the Friedrich Miescher Laboratory of the Max Planck Society in Tübingen, receives a Career Development Award from the Human Frontier Science Program (HFSP) for a basic research project in the field of structural plant biology. The three year project will start in August 2012 and is funded with 300.000 US Dollar. Michael Hothorn investigates receptor kinases, membrane proteins located at the cell surface of plant cells. These molecules act as signal transmitters in many important processes like growth and development, in immune defense responses or in the initiation of symbiotic interactions. “Receptor kinases are able to recognize specific substances on the cell surface. When these ligands bind, a kinase module inside the cell is switched on,” the scientist explains. Kinases are enzymes, small catalysts that drive certain chemical reactions. Michael Hothorn wants to know what happens in the short time span between ligand binding on the cell surface and the onset of the kinase reaction. Over two-hundred such receptors exist in the small genome of Arabidopsis thaliana, an important plant model organism. Career Development Awards are granted to selected HFSP Long-Term Fellows who have done postdoctoral research abroad and return to their home country. The Award supports scientific independence of young researchers and helps them to establish their own laboratory. Michael Hothorn graduated from the University of Heidelberg and received his PhD from the European Molecular Biology Laboratory (EMBL). From 2008 to 2011, he was a HFSP Long-Term Fellow at the Salk Institute for Biological Studies in San Diego, California. Since January 2012 he is leader of the junior research group Structural Plant Biology at the Friedrich Miescher Laboratory in Tübingen. Participants of the HFSP are Australia, Canada, India, Japan, Republic of Korea, Norway, New Zealand, Switzerland the United Kingdom, the United States of America and the European Union. The HFSP supports innovative and interdisciplinary basic research focused on the complex mechanisms of living organisms. The Career Development Award is conferred to applicants proposing an innovative frontier research program that holds promise for the development of new approaches to problems in the life sciences with potential to advance the field of research significantly. Michael Hothorn is one of eight awardees of 2012 who, according to the HFSP, were selected from 55 applicants. Plants, just like animals, use small molecule hormones to integrate the growth and development of their cells and tissues. The hormone receptor proteins that recognize these ligands are however very different in plants and animals. A new study now confirms that plants use signaling proteins normally found in bacteria to initiate certain hormone responses. Crystal structure of the AHK4 hormone binding domain surrounded by structures of the cytokinin ligands analysed in the study. One of the most fundamental tasks of a cell is to recognize signals from the outside world at the cell surface, and to relay these signals to the cell’s interior. The different kingdoms of life have evolved different membrane receptor proteins to fulfill this task. Interestingly, plant genomes contain receptors that are closely related to the animal world, but also proteins that are somewhat reminiscent of sensor histidine kinases, the key players in bacterial membrane signaling. It has been debated whether these proteins were indeed adopted from the bacterial world, or whether they evolved independently. One such receptor is the Arabidopsis histidine kinase 4 (AHK4), a membrane-integral receptor for the classic plant hormone cytokinin. A crystal structure of its extracellular hormone binding domain now reveals just how closely related plant cytokinin receptors are to bacterial signaling proteins. Hothorn et al. solved the structure of AHK4’s hormone binding domain mainly to understand how this receptor can interact with chemically very diverse cytokinin ligands, natural cytokinins and synthetic cytokinins which are important growth regulators and defoliants in agriculture. The structures, however, did not only reveal how the receptor can accommodate these different molecules: AHK4 turned out to look exactly like a bacterial signaling protein, suggesting that the plant receptor may have originated from an bacterial ancestor. And there was a ligand stuck in AHK4s hormone binding pocket that looked exactly like a plant cytokinin, but was carried over from the engineered bacterial expression strain used to produce AHK4 for structural studies. This meant that bacteria did not only contain signaling proteins with a shape very similar to AHK4, but also small molecule ligands that look exactly like the plant hormone. These findings allow speculation that cytokinin signaling may have evolved already in bacteria, and was later adopted to control growth, development and the integration of stem cell populations in higher plants. On the more practical side, the different AHK4 structures suggest how to design new cytokinins rationally, with potential application in basic research and in the field. Transmembrane signaling in a plant cell aided by a steroid. Every living plant cell and animal cell is surrounded by a membrane. These cellular membranes contain receptor molecules that serve as the cell’s eyes and ears, and help it communicate with other cells and with the outside world. The receptor molecules accomplish three basic things in the communication process: 1) recognize an outside signal, 2) transport that signal across the cell’s membrane and 3) initiate the reading of the signal inside the cell and then initiate the cell’s response to that signal. These steps are collectively known as transmembrane signaling. Transmembrane signaling in animal cells has been significantly more studied and observed than that in plant cells. But now, with support from the National Science Foundation, researchers from Joanne Chory’s laboratory at the Salk Institute have published new observations about transmembrane signaling in plants; their paper appears in the June 12, 2011, advanced online edition of Nature. While studying transmembrane signaling in plants, Hothorn and colleagues observed the steroid, shown in yellow, attach to a membrane-bound receptor, shown in blue. 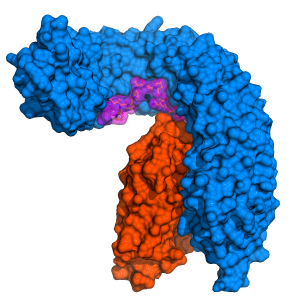 This attachment enabled the steroid’s counterpart–a co-receptor protein, shown in orange–to bind to the blue receptor. Once bound, the orange co-receptor and the blue receptor become glued together by the yellow steroid, allowing their intracellular domains to touch and initiate communication. The plant steroid hormone receptor BRI1 is a membrane-bound receptor kinase that controls an important growth signaling pathway in plants. Jaillais et al. now report that BRI1 uses tyrosine phosphorylation, an on/off switch that was thought to be restricted to the animal kingdom, to dissociate its own inhibitor protein from the plasma membrane. Shown here is a confocal image of a wild-type Arabidopsis seedling expressing GFP-tagged myristoylated BKI1 (green) localized to the plasma membrane. Chloroplasts autofluoresce (red). The stem and root of the seedling are represented by a structural model of the two evolutionarily conserved functional motifs of BKI1: a short helical segment (stem; ribbon diagram) that binds the BRI1 kinase domain, and a lysine–arginine-rich motif (root; bonds representation) that targets BKI1 to the cell membrane. Image: Courtesy of Yvon Jaillard, Michael Hothorn and Jamie Simon, Salk Institute for Biological Studies. Image appeared on the cover of Genes & Development vol 25(3), Feb 1 2011. Signal perception at the cell surface and transduction of this signal to the cell’s interior is essential to all life forms. Animals mainly use G-protein coupled receptors and tyrosine receptor kinases to perceive such signals. Plants however evolved membrane-integral receptor kinases that are very different from the receptors found in animals and usually have serine/threonine kinase activity. A well studied family member is the brassinosteroid receptor BRI1, which controls an essential growth signaling pathway. BRI1 is kept in its basal state by its intracellular tail and by interaction with a small inhibitory protein known as BKI1. Autophosphorylation of the BRI1 receptor is necessary to release the inhibitory protein into the cytosol and to activate the steroid signaling pathway, but the molecular mechanism has been enigmatic. Jaillais et al. have now discovered that BKI1 acts through two evolutionarily conserved motifs: a 20-amino-acid sequence that binds the receptor kinase domain and a lysine-arginine-rich motif that anchors the inhibitory peptide to the plasma membrane. BRI1-mediated phosphorylation of a key tyrosine within the membrane-targeting motif releases BKI1 from the membrane, relieving kinase inhibition and allowing for the formation of an active signaling complex. The phosphorylation of BKI1 is the first documented example of tyrosine transphosphorylation in plants, and importantly, the phosphorylation and release of kinase inhibitor proteins appears a unifying theme in tyrosine kinase signaling in animals and plants. By defining common features in plant and animal receptor signaling pathways, the Salk researchers hope to learn more about what the requirements for a robust signaling system are. Although plants don’t encode canonical tyrosine kinases in their genomes, the authors predict that tyrosine phosphorylation will emerge as an important topic in plant signaling. It can be found in all life forms, and serves a multitude of purposes, from energy storage to stress response to bone calcification. This molecular jack-of-all trades is polyphosphate, a long chain of phosphate molecules. Researchers at the European Molecular Biology Laboratory (EMBL) in Heidelberg, Germany, are now the first to uncover how this chain is assembled in eukaryotes (organisms whose cells have a nucleus). The study, published this week in Science, uncovers the function of a single protein with a wide range of potential implications ranging from improving crops to fighting diseases such as sleeping sickness. Scientists have known for a long time how bacteria make phosphate chains, but how the same process works in eukaryotes has so far remained elusive. EMBL scientists now show that in yeast a protein called Vtc4p is responsible for the production of polyphosphates. Vtc4p is part of a protein complex called vacuolar transporter chaperone complex (VTC) that is usually found in the membranes of vacuoles – pouches in which cells store molecules for later use, transport or destruction. Vtc4p is partly embedded in the membrane and has a ‘tail’ hanging into the cell, which removes a phosphate molecule from ATP, an important energy carrier in the cell. Vtc4p uses the energy that is released by that cleavage to add the newly acquired phosphate to a growing chain of phosphates. Since the rest of Vtc4 straddles the membrane, scientists suspect this protein probably transfers the polyphosphate chain to the vacuole as it produces it. The researchers determined Vtc4p’s function by looking at its 3D structure. “This study emphasises the importance of structural biology not just to show what molecules look like and how they work but also what that function is,” says Michael Hothorn from Scheffzek’s group at EMBL, who is presently at The Salk Institute for Biological Studies in California. Since polyphosphate is a ubiquitous, multi-tasking molecule with many different functions, discovering how it is produced could have implications for many different fields. Although Vtc4p is not present in plants, the discovery could have implications for agriculture, for instance in the production of fertilizers and high-yield crops. Polyphosphate is important for plant growth, and the scientists suspect Vtc4p could play an important role in making it available to plants that have fungi living in their roots. Because the VTC can move from the membrane of the vacuole to that of the cell, it could assemble phosphate chains and transfer them to outside the fungus cell, where they would be available to the plant. The research could also pave the way for new treatments for diseases such as sleeping sickness and Chagas disease, as the parasites that cause them need polyphosphate chains to survive.